Home Health	Can Magnesium Cure Eczema? Eczema is no breeze in the park, it’s a condition that’s characterized by itchy, red, dry, swollen patches of skin caused by inflammation. It’s most commonly found in children, although adults can also get it. It’s also known as atopic dermatitis and is typically treated with oral medications and steroid creams. Eczema is almost always itchy, sometimes the itching will start before the rash appears, but when it does, the rash most commonly appears on the face, back of the knees, wrists, hands, or feet. It may also affect other areas as well. 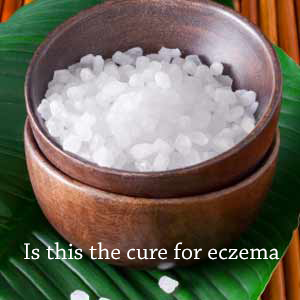 The exact cause of eczema is unknown, but it’s thought to be linked to these conditions. Some people may have “flare-ups” of itchy rashes in response to certain substances or conditions. Coming into contact with rough or coarse materials may cause the skin to become itchy. For others, feeling too hot or too cold, exposure to certain products like soap or detergent, or coming into contact with animal/pet dander may cause an outbreak. Upper respiratory infections or colds may also be triggers. Stress may cause the condition to worsen. Well, my experience isn’t really mine personally, I have a college buddy who’s daughter was born with eczema. Her eczema was all over her arms and legs, she scratched the lesions all the time developing into unsightly scabs. I suggested to my buddy that there was research and personal testimony of people reversing or eliminating the symptoms of eczema by soaking in epson salts, magnesium flakes, or by using a magnesium chloride spray. To learn more about magnesium see my post on magnesium. After my buddy did his own research he decided to first try using a magnesium chloride spray on his daughter. The spray worked quickly as he saw a difference in his daughter’s skin over night, the next mourning he could see the lesions healing, he couldn’t believe what he was seeing. But their was a problem, his daughter found the spray to be intolerable because it left an intolerable burning sensation after application. So he tried the Ancient Minerals magnesium flakes bath soak next, and this turned out to be the golden apple. Not only did the magnesium flakes bath reverse her eczema, but it also facilitated the healing of the scars she developed from the scratching over the years. He stated that the bath would last about 5 months before she started to develop any kind of eczema symptoms again, but he also stated that each time she did the bath the eczema would disappear for longer periods of time. Wow, in my research of eczema I’ve not come across magnesium as a treatment. I have seen reports of vitamin D as an aid, and bathing in the Caribbean sea oddly enough was good for it. I’m willing to try anything to get the itching to stop. Maybe the flakes bath is the way to go.